This was not your normal Grilled Ham and Cheese. This one started with a recipe from Cookstr, Grilled Italian Ham and Cheese. It is from the Great Grilled Cheese: 50 Innovative Recipes for Stovetop, Grill and Sandwich Maker Cookbook. I have not bought a cookbook in a while but this is one I would like to see. The ingredients were Pancetta, Fontina Cheese, and Sauteed Leeks. I thought if it is called Grilled Italian Ham and Cheese why not add some Prosciutto too. Really glad I did. Chris gave this sandwich two thumbs up. 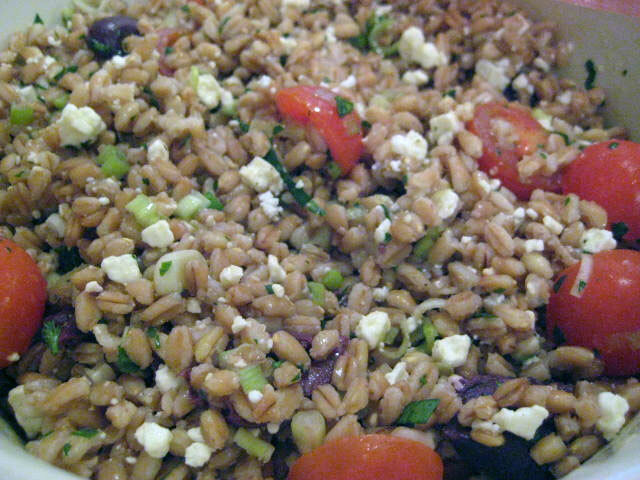 And the side dish was Farro Salad. Simple ingredients, basically using up stuff in the refrigerator. Kalamata Olives, Feta Cheese, Scallions and Parsley. The dressing was 1/4 cup olive oil and 2 tablespoons Balsamic Vinegar, Salt and Pepper. And this also received two thumbs up. Not bad for a Monday. Everyone ready for Hell's Kitchen and Master Chef? Summer television at it's best!